Once upon a time, I went to cosmetology school. The sooner everyone forgets that little eleven month misadventure, the happier I will be, but the evidence of the experience will always remain. For example, I know a thing or two about nail polish. At my school, we sold O.P.I nail lacquer, the same kind offered at the salon my mother went to when I was little. At the time, I couldn’t conceive of spending $8 on a bottle of nail polish – fortunately, as a student, I didn’t have to. I made use of my 50% off discount frequently and enthusiastically. The first O.P.I shade I ever bought was “Chick Flick Cherry,” a deep, almost gothic red. I have never especially liked red polish – it strikes me as a bit cliche – but I was required to use a plain red to practice manicures, and I was told I would need it when taking my state board exam. I then wore it to my mother’s funeral, for no other reason than red being her favorite color, and I don’t believe I have touched it since. Since graduating cosmetology school and moving on to a life of dismal food service slavery, I don’t paint my nails much anymore. Manicures don’t hold up well in the cruel environment of a restaurant. The daily onslaught of harsh chemicals, hand washing, and general abuse leave the edges chipped and flaking within hours, but beyond that, the job has compromised my spirit to the point that I can’t bring myself to spend my free time on vain frivolities like nail painting. In this sense, my job has fundamentally changed who I am. It takes far too close to everything I have. For months, now, I was a food service slave by day and a novelist by night. The wonder of shaping an alternate reality in the hours before I went to bed sustained me through the hours of assisting rude or downright dumb customers. Every day contained the promise of something better; I could go home and write. Now, the book is done (more or less). The promise is gone – and as such, work seems more torturous than ever, even though I’m better at it all the time and a promotion looms in the near future. Being good at something is little solace if you don’t want to be doing it in the first place. 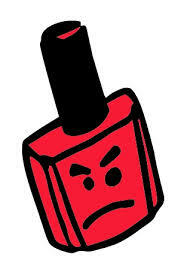 So, I’ve decided I should start painting my nails again, at least my toes – one particular shade, one of O.P.I’s most famous – a perfectly generic and otherwise unremarkable red by the name of I’m Not Really A Waitress. I will wear it not for aesthetics, but as a reminder. My job doesn’t define me. It pays the bills, for now, and, God willing, something better will come along and do the same someday. The color itself is a prayer, written across my nails: I’m not really a waitress. I’m a writer. This entry was posted in Uncategorized and tagged life, writing on May 31, 2013 by Yvonne Frank.